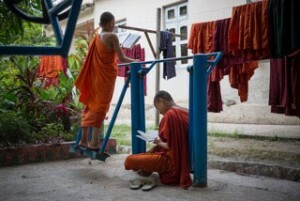 At Oo Yin Pariyatti Monastery, the range of subjects taught in English include a range of Dhamma Studies and also in English Grammar for all Koyins (Novice monks). These subjects in English begin at the youngest age, up to Dhammacariya Level (A teacher who is qualified to teach the Buddha’s scripture). The English Grammar is taught from the beginning of Koyin levels at the age of 6 years old. At a younger age, the English Grammar is not compulsory. Grade 7, 9 and 11 Levels, English Texts of the Basic Education Syllabus Curriculum Level given by the Ministry of Education- (A general text taught throughout all schools in Myanmar) is compulsory for studies for the Koyins as they get older, about 13- 17 years of age. They receive an examination at the end of each level. There are 3 levels of Dhammapada- Dhamma verses and stories expounded by the Buddha taught at Oo Yin Monastery. Uttamapurisa Dipani, a Great Discourse given by Venerable Ledi Sayadaw. Vissudhi Magga- The Great Discourse on The Path of Purification. Sangha students in an English Dhammapada class. Koyins on the outdoor exercise equipment, studying.